Paul Carey-Kent, Dave Beech and Andrew Hunt discuss their texts together. Public art is often seen as the worst kind of bland, art-by-committee cultural filler, but haven’t recent works by artists such as Bill Drummond, Scott King and Mike Nelson shown how genuinely charged art in the public arena can be? To Boycott or not to Boycott? Political activism has made an astonishing return to the art world over the past few years, with the threat of artists’ withholding their work from exhibitions the most popular recent trend. But what is the nature of these different protest tactics, and how can artists effect change? The show is hosted by Chris McCormack the Assistant Editor of Art Monthly. 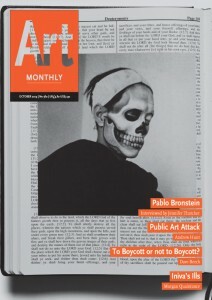 This entry was posted in Art Monthly Monthly and tagged Andrew Hunt, bill drummond, Boycotting museums, dave beech, Folkstone Triennial, Mike Nelson, Paul Carey-Kent, public art, Scott King on November 26, 2014 by artmonthly.